- Integration and Programming of Commercial HMI and Windows CE touch screens with PLCs or embedded systems. 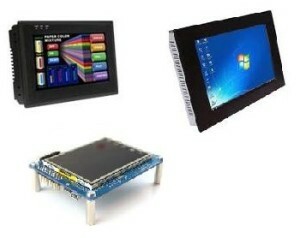 - Custom Design of touch screen controllers for OEM applications. - Large selection of touch screens from 3.5” to 17”.Choose from widescreen, high speed, high resolution, full size or compact models to meet your automation and control needs. - Complete Robotic System Solution when integrated with the interconnection board and stepper or servomotor controllers. – Integration and Programming of Commercial HMI and Windows CE touch screens with PLCs or embedded systems. – Custom Design of touch screen controllers for OEM applications. – Large selection of touch screens from 3.5” to 17”.Choose from widescreen, high speed, high resolution, full size or compact models to meet your automation and control needs. – Complete Robotic System Solution when integrated with the interconnection board and stepper or servomotor controllers.